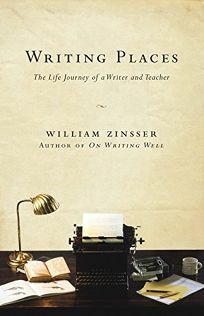 Influential journalist, author and educator Zinsser (American Places, Easy to Remember) produces an elegantly written memoir, featuring an array of vividly drawn tales from 50-plus years of writing, reporting and teaching in London, the Hamptons, Yale University and elsewhere. A master of storytelling, what makes Zinsser&apos;s memoir most effective is the gentle connection he forms with nearly everyone who enters his life, from his students at Yale, who treated Zinsser as a trusted confidante, to the elusive golf-ball thief ""Mr. Roby,"" who Zinsser celebrated in a Saturday Evening Post article. Zinsser also chronicles his days as a writer for the Herald Tribune and Life, as well as the lean times when freelance work alone sustained him. Zinsser also delves into the development of his own non-fiction writing course at Yale, his bestseller On Writing Well, and a multitude of other articles and books. With careful introspection and nothing but gratitude for the people in his life, Zinsser makes perfect sense out of his long, strange journey.